Should I Choose Hydronic Heating for My New Home or Renovation? What is a hydronic heating? Hydronic heating systems use water to transfer heat. The water can be in liquid form or steam. The heart of a hydronic heating system is the boiler that heats the water. How is hydronic heating more efficient than other types of heating systems? One reason hydronic heating systems are more efficient than forced air heating systems is there is no heat loss in ductwork. Hydronic radiant floor heating is probably the most comfortable contemporary way to heat your home. The entire floor is the heat source and heat is directly delivered to you when any part of you touches the floor. Heating from the floor up increases the mean radiant temperature, which allows occupants to feel comfortable at a lower temperature than in a room heated by more traditional means. Running any hydronic heating system requires less energy than other heating systems. The boilers for steam systems do need to be run at higher temperatures than those that run systems that run on liquid water. Newer high-efficiency boilers (add link to text) make hydronic systems even more energy efficient. How will hydronic heating improve the air quality of my home? Hydronic heating systems are self-contained. They do not move dust and other allergens around your home, or pull outdoor air in, as forced air systems can. Hydronic heating systems do not change the moisture content of the air. Are there other benefits of hydronic heating systems? Hydronic heating systems are quieter than forced air systems, because a boiler does not require a motor and fan to move heat into your home. Radiant heat floor systems are the quietest, with no clanking, gurgling, or hissing from the special flexible pipes that run under the floor. Radiant floor heating is also the easiest system to integrate with any interior design or redesign. There are no grated heat registers, radiators, or baseboards to work around; flammability is not an issue because stoves or fireplaces with gas or natural flames are avoided. What are my hydronic heating options? The oldest hydronic systems in American homes employ steam radiators. If you are renovating an older home and plan to keep your steam system, you can reclaim space with new radiators that give you the same heating power with a sleeker design. The next innovation in hydronic heating was baseboard fixtures; these radiate heat from metal fins. The newest form of hydronic heating is radiant heat, the most efficient of which is radiant floor heating. Do hydronic heating systems require regular maintenance? There is no such thing as a heating system that requires no maintenance. Hydronic heating systems tend to be low maintenance. Radiant heating systems require the least. The part of hydronic heating systems that requires the most attention is the boiler. Oil-burning boilers require regular attention. 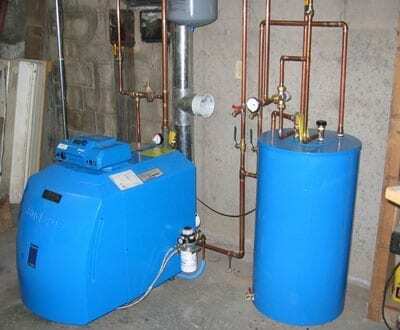 An oil-fired boiler requires yearly maintenance. This is best done by a professional. Hiring a professional will save you money in the long-run, as an oil-fired boiler that does not receive annual service is at much higher risk of malfunctioning. This is not only inconvenient and costly, it can be dangerous. If you have a fossil fuel burning appliance of any type you should have a carbon monoxide detector. Read our “Why Should I Upgrade to a New High-Efficiency Boiler?” post to learn what regular maintenance the U.S. Department of Energy suggests..